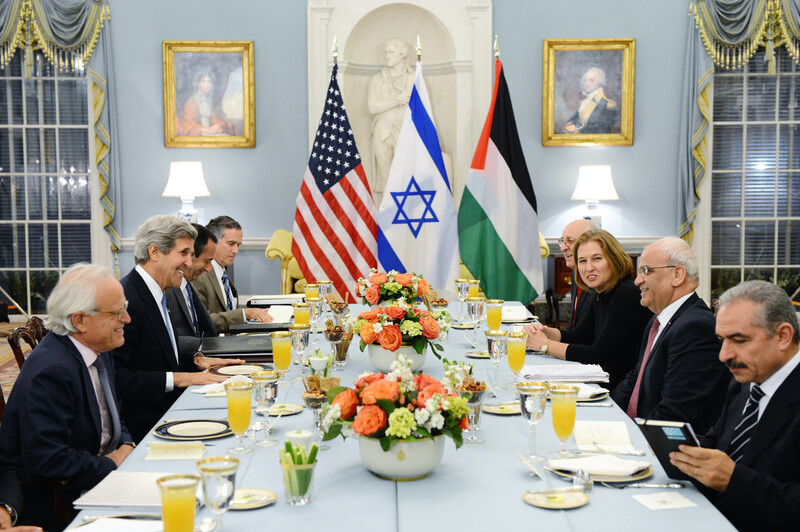 Erkat, Kerry, Livni. Photo: U.S. Department of State/flickr. Any third party mediator dealing with the Israel-Palestine conflict is burdened with a 130-year-old dilemma: insoluble disagreements between Palestinians and Israelis over the causes of the conflict continue to obstruct peace-making efforts today. There is no easy way out of this dilemma, but a few observations may be useful in pointing the way forward for any future mediation. Because many third parties can see the validity of both sides’ perspectives on the causes of the conflict, they may be led to believe that the parties themselves can ‘bridge’ their conflicting narratives. Such bridging appears necessary since issues such as the Palestinian right of return and recognition of Israel as a Jewish state inevitably force history onto the negotiating table. But those who believe that narratives can be bridged have failed to grasp the depth of the chasm that separates the parties’ views of the conflict. While some Israeli and Palestinian historians and analysts may have come to share an interpretation of key events, the strongest voices on each side – amongst both the leadership and in the public – continue to propagate narratives based on absolute beliefs. And there is no such thing as a mid-way point when it comes to absolute beliefs. Mediators should thus avoid trying to persuade parties to recognize each other’s narrative as a part of the negotiation. Such a demand is only likely to aggravate the tensions and emphasize the gaps between the sides. While it is understood that the USA is not neutral in this case (it does not have equal relations with both parties), if it is to be an effective peace broker it needs to become impartial (treating actors in a fair manner). Yet despite President Obama’s apparent desire to divest the US of its reputation as a ‘dishonest broker’, in a striking act of partisanship he recently came down firmly on one side of the narrative question. In his March 2013 Jerusalem speech he validated Israel’s historical and current narrative in fulsome detail, just as he was trying to launch a new peace process. The President consequently left his Secretary of State in the awkward position of having to ask the Palestinians to come to the table based on the premise that their historical claims are invalid, and their sense of belonging to the land illusory. It is not impossible for non-neutral mediators to be effective: but they must be sufficiently aware of the nuances of the conflict to know when taking a stand on core issues will lead them to lose their legitimacy as mediators. The President committed another mediators’ faux pas when in his Jerusalem speech he asked the Israelis to take pity on their enemies and retreat from occupation. In doing so, he located the conflict squarely in the present and validated a view that is mostly heard on the Israeli side: the past is done, there is nothing we can do about it, let’s move on. First, it is contradicted by the fact that Israel’s demand that Palestinians recognize it as a Jewish state is a quintessentially historical issue, based on a continuing dispute over the nature and origins of the conflict. If the Israelis want the Palestinians to ‘move on’ from the past, they should forego their demand for a form of recognition that can only ignite a battle over history. Second, the ‘move on’ approach is a luxury Israelis might afford but Palestinians feel they cannot. For despite the genuine feeling shared by many Israelis and Jews that Israel is being delegitimized in the international community, the historical suffering of the Jews, and their perspective on the conflict, has been recognized in the Western world. More importantly, their story has been accorded tangible physical and legal recognition via the very existence of Israel. In spite of the very real threats they face and their feelings of insecurity, Israelis can choose to ‘move on’. The future is to their advantage. For Palestinians this is not the case. While their cause is gaining support in the West, their historical view of the conflict is still so far from being recognized that the US President trounced it publicly without seeming to realize the implications of his words. Further, unlike the Israelis, the Palestinians’ sense of rightful belonging on the land that is now Israel, the West Bank and Gaza has not taken on an institutionalized reality in the shape of a state. On the contrary, their claims to the land are being continually undermined by Israeli statements and settlements, tacitly approved by the lack of response in the international community. It is thus futile to tell the Palestinians to let bygones be bygones: as long as they feel their future is intimately linked to recognition of their history they are unlikely to embrace the ‘move on’ approach. The past is their future. So how can third party mediators square the circle? A peace process is not limited to negotiations: its natural life must extend beyond a peace accord in order to be viable. In the unlikely event that Palestinians and Israelis were to negotiate an official end to violent conflict, a host of obstacles would still need to be overcome: implementing the agreement, managing mounting tensions between Jews and Arabs within Israel, addressing the divisions between Palestinian factions, ensuring arrangements regarding internationally significant holy places. While a negotiation that tries to square the circle on issues of rights and recognition is unlikely to succeed – and one that tries to eliminate these core issues is likely to be perceived by the public as illegitimate – a post-negotiations process can allow for these issues to be addressed through non-violent channels: the intractable issues would be taken off the negotiating table but not out of the peace process. For example, the well-being and dignity of the Palestinian refugees must be addressed during a negotiation: how they are compensated, where they live, their future welfare and security. But the principle of the right of return, including the Palestinian wish that Israel should accept responsibility for the refugees’ original displacement, is a ‘fixed’ national aspiration: the Palestinians cannot ‘negotiate’ or bargain it away. The Israelis, however, cannot accept the right of return: they will not accede to their responsibility for the refugee problem or the conflict: they will not declare their country a sin; and they consider that the demand for the right of return contravenes the very idea of two states for two people who have declared an end of conflict. However, in a peace process that follows the negotiations, the core of the right of return may be addressed. Israelis who have normal relations with their neighbors and are no longer demonized in the region will more likely be open to deeper reflection on the origins of the conflict. They could be willing to acknowledge what the Palestinians have experienced, admit their part in it, and commemorate rather than destroy evidence of the Arab historical presence in what is now Israel. This is more likely to meet some Palestinian needs in regards to the core of the right of return than anything they are likely to wrest from the Israelis during the negotiations. Similarly, Israel’s right to live in peace and security can be addressed in the negotiations via concrete agreements that offer mutual security and normalized relations. But Israel’s demand to be recognized as a Jewish state, or as ‘the homeland of the Jewish people’, is an absolute principle. It is based on the Israelis’ desire to feel that their existence has been legitimized once and for all, and their historical and religious connections with the land have been accepted. Like the right of return, this issue has recently taken on the aspect of a fixed national aspiration. This concept, however, cannot be genuinely embraced by the Palestinians as part of the text of an agreement. It would require that they concede on their view of history, identify what they believe is their own historical homeland as Jewish rather than Arab/Muslim, and declare their historical objection to Zionism as misguided. In a post-negotiations peace process, however, the issue of recognition may be perceived differently. Palestinians who have a viable state, a sense that that their dignity has been restored and are responsible for their own destiny, may be more amenable to acknowledging the Jews’ history of persecution and historical and religious ties to the land, without conceding that the creation of Israel was a legitimate enterprise. By virtue of economic, cultural and security ties with its neighbors Israel can become an integrated reality in the region, and gain a form of tangible and durable recognition that carries more weight than a force-fed statement by their enemies during negotiations. Third party mediators dealing with the core elements of the Israel-Palestine conflict are in a difficult position. Negotiations can only be successful if parties do not expect the insoluble to be solved. And yet a peace process requires that issues of rights and recognition be addressed in order to ensure post-agreement stability. The most significant role that mediators could play is to help develop effective mechanisms for the post-accord peace process that would not be shy of confronting the core issues head on, and yet prevent these from turning into intractable obstacles to peace. Dr. Natasha Gill is founder and director of TRACK4, which runs negotiation simulations for diplomats, mediators, journalists, policy makers, students and community leaders. “Mediation Perspectives” is a periodic blog entry provided by the CSS’ Mediation Support Team. Each entry is designed to highlight the utility of mediation approaches in dealing with violent political conflicts. Can the Two-State Solution Be Saved?